The city will use grant money to get the clock working again but still has no funding to repair the tower that holds it up. The Biddeford City Council has voted to repair and restore the historic clock on top of city hall. Biddeford last year won a $150,000 historic preservation grant awarded by American Express and the National Trust for Historic Preservation through the “Partner in Preservation: Celebrating Diversity on Main Street” campaign. Biddeford was one of 20 communities across the country chosen to compete for a share of the $1.6 million in grants awarded for preservation projects. The grants were awarded based on public online voting. The grant was awarded to the nonprofit Heart of Biddeford, which ran a campaign to draw attention to the contest. Councilors voted Tuesday to use the grant money to hire a Freeport company to fix and restore the clock, which stopped working four years ago. No city funds will be used to do the work. Balzar Family Clock Works submitted a bid of $86,725 to do the work. The only other bid received was from David Graf of Kittery, who bid $105,000 on the work. Work needs to begin by this spring in order to keep the grant money, according to city officials. The decision to award the bid to Balzar Family Clock Works had strong support from the council. Councilor Michael Ready cast the sole opposing vote. Phil Radding, the city’s facilities manager, said Balzar Family Clock Works will remove the clock and bring it to their Freeport workshop for the repairs. He said the clock tower structure has been stabilized and the repaired clock will not be at risk of falling once it is reinstalled at city hall. In addition to the clock itself not telling tiume, the condition of the entire clock tower atop City Hall has been a concern of city officials for years, but they have so far been unable to sell residents on the need to repair it and fund other upgrades in the 124-year-old building. Voters rejected referendums to fund the work in 2007, 2012 and 2015. City officials in the past have estimated it would cost at least $1.8 million to fix the clock tower. Biddeford City Hall, listed on the National Historic Register, was designed by noted Portland architect John Calvin Stevens. The granite and brick City Hall was built in 1894 to replace one destroyed by fire. 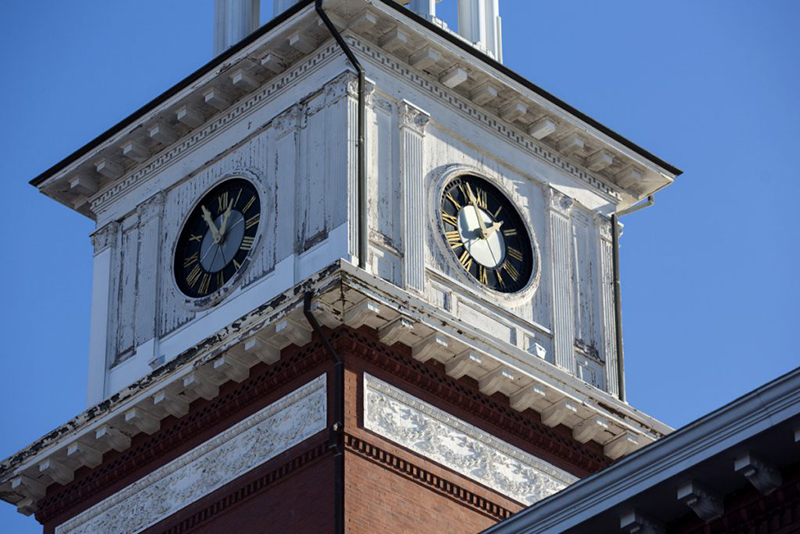 In 2014, Maine Preservation added the building’s clock tower to its annual list of the state’s most endangered properties. Work that needs to be done to restore the clock tower includes regilding the copper dome, fixing wood paneling and windows on the tower, restoring stained-glass windows, redoing the roof under the bell, and fixing the clock itself. Decorative railings were removed from the tower when pieces started falling to the street below.